"When animals attack" has certainly been a popular theme in horror movies since Alfred Hitchcock unleashed The Birds in 1963 on an unsuspecting public. 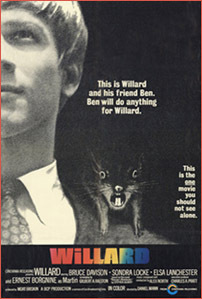 There have been several involving rodents but none has had the impact or enduring appeal of 1971's Willard. Based on Stephen Gilbert's novel Ratman's Notebook, the picture tapped into the popular culture of the time, earning big bucks at the box office and spawning a sequel. Novelist Gilbert wrote the screenplay under the name Gilbert Ralston and directing chores went to Daniel Mann, a veteran who had earlier helmed classics such as Come Back Little Sheba, The Rose Tattoo, Butterfield 8 and Our Man Flint. Willard was truly a change of pace indeed. Willard Stiles (Bruce Davison) is an introvert who lives with his domineering and sickly mother, Henrietta (Elsa Lanchester). His father has passed on and the two keep each other company in a huge house. Although he's a clerk at a company that his father founded, Willard doesn't get much respect and must contend with his boss Al Martin (Ernest Borgnine)...who doesn't care for him and has kept him on the payroll only as a favor to Mrs. Stiles. One day, Willard and his mom notice a rodent problem in the yard. Henrietta would like to exterminate them immediately but Willard develops a strange bond with the animals. Two of them, whom he names Ben and Socrates, become his best friends. In fact, he sometimes travels with them in a black bag...occasionally bringing them to work. When his mother dies, Willard has to fend for himself. Taxes are owed on the house and none of Henrietta's friends are willing to help him pay off the debt. Willard is becoming increasingly isolated, his only friends being the rats and mice he keeps in his basement - and a kindly temp at work, Joan (Sondra Locke). However, he has no use for a cat Joan gives him and he quietly gives it away to a stranger. His communication with Ben and his little friends is so great...Willard uses them to get back at people who are making his life miserable. He ruins an outdoor party Mr. Martin throws by releasing the rats and scaring the guests. When Mr. Martin fires Willard...in an effort to get him to leave his house so he can buy it and build an apartment building on the property...Willard's psychosis begins to take over even more. On his last day at the job, he has brought Ben and Socrates to the office and leaves them in the storage room. A co-worker sees the rats and screams. Mr. Martin grabs a stick and kills Socrates. Willard is crushed and he feels especially sorry for Ben. He tells his little friend that it wasn't his fault...there was nothing he could do. He puts the rodent in his bag and heads home. That night, he hatches a plan for revenge against Mr. Martin. Willard had overheard him saying that he was going to stay late at the office. He loads his car with his rat friends and heads to his former job. Sure enough, he finds Mr. Martin still working. Ben and the other rats surround him. When Mr. Martin tries to fight his way out, Willard yells, "Tear him up!" Which they proceed to do. Mr. Martin falls out of a window to the pavement below and dies. Feeling guilty about this turn of events, Willard kills every rat he can find in the house by drowning them. He tries to start his life over and even invites Joan over for the first time. But there is a commotion in the basement. He finds a horde of rats...Ben has brought many more back to the home. Willard asks Joan to leave and then attempts to feed the rodents. But Ben is still angry over Willard's mass extermination. He bites him and calls out for the other rats. "I've been good to you, Ben!" Willard screams. It's too late. The vengeful rats jump on him and Ben is victorious. Willard was a surprise success upon its release. Despite its dark nature, young audiences flocked to the film and identified with the alienation faced by Willard. It was a true character study (with horror elements of course), ultimately poignant and heartbreaking. Twenty five year-old Bruce Davison gave a sympathetic portrayal as the young man, no easy feat considering the subject matter. Ernest Borgnine and Elsa (Bride of Frankenstein) Lanchester were superb in supporting roles, as was future Clint Eastwood partner Sondra Locke. Willard was followed by 1972's Ben, a decent enough sequel and perhaps best known for the hit theme song sung by Michael Jackson.